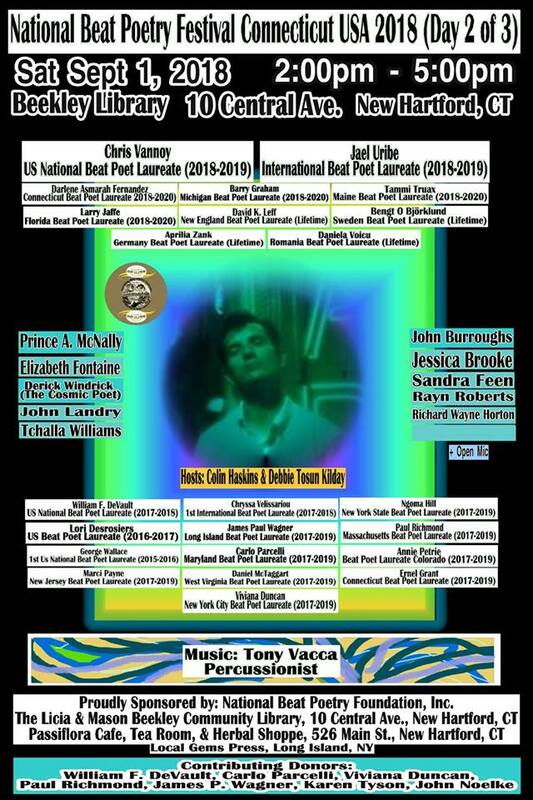 I'm thrilled and honored to have the opportunity to read on days two (9/1) and three (9/2) of this year's National Beat Poetry Festival at The Licia & Mason Beekley Community Library, 10 Central Avenue, New Hartford, Connecticut 06057. I wish I could attend the day one (8/31) festivities, too, but I'll be traveling. We will also celebrate the release of BEAT-itude: National Beat Poetry Festival 10 Year Anthology from Local Gems Press this weekend. I'm happy to be one of many writers included in that. 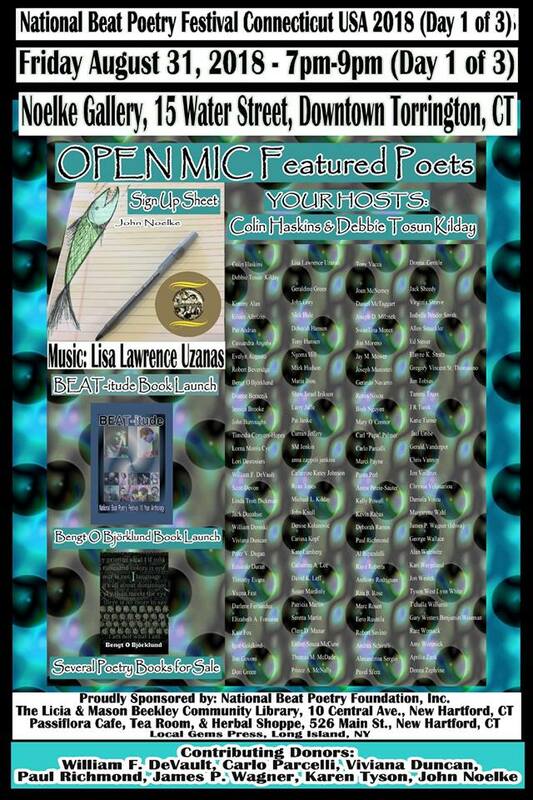 Just some of the featured poets on the days I'll be there (besides me) include William F DeVault, Lori Desrosiers, George Wallace, Marci Payne, Chris Vannoy, Jael Uribe, Chryssa Velissariou, James Paul Wagner, Carlo Parcelli, Daniel McTaggart, Viviana Duncan, Ngoma Hill, Paul Richmond, Annie Petrie, Ernel Grant, Krysia Jopek, Sandra Feen, Jessica Brooke, Rayn Roberts, Richard Wayne Horton, Prince A McNally, Elizabeth Fontaine, John Landry, Tchalla Williams, Derick Windrick (The Cosmic Poet), Bengt O Björklund, Barry Graham, Larry Jaffe and Evelyn Augusto. 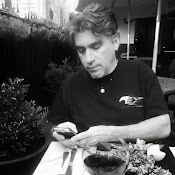 Plus, we'll be treated to featured music by Tony Vacca and Donna Gentile. Debbie Tosun Kilday and Colin Haskins will be our hosts. 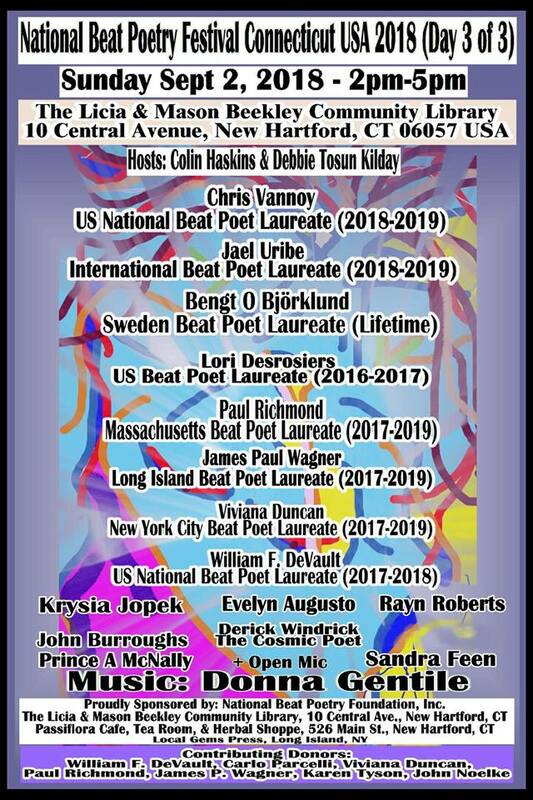 Please follow the National Beat Poetry Foundation, Inc. on Facebook for updates and more information about this weekend's festival and the many other events the Foundation puts on all year long: https://www.facebook.com/nationalbeatpoetryfoundation. 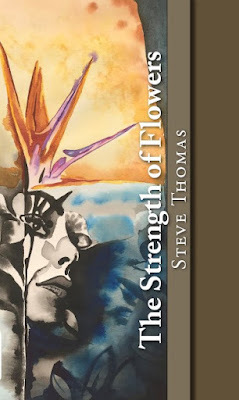 Crisis Chronicles Press is pleased to announce the imminent publication of Steve Thomas' new book, The Strength of Flowers. Steve has been a stalwart of the Cleveland poetry scene for many years, and now, finally — this collection. It's about time! The Strength of Flowers is 80 pages, perfect bound, 5.5 x 8.5", featuring cover art by Danielle Stull, and available beginning 20 August 2018 for $12 from Crisis Chronicles Press, 3431 George Avenue, Parma, Ohio 44134 USA. ISBN: 978-1725142312. Poems include "Mapless," "When Miriam met Raymond Carver," Smoke dream, "Being moved unaware," "Contact in a contrary world," "Staring at Issa in the afternoon revisited" and many more. Meet and hear the author on 10 October 2018, 7 pm, at Mac's Backs Books on Coventry in Cleveland Heights, Ohio. Steve Thomas has had poems published in Baldwin Wallace University’s The Mill during the years of 1984 & 1985. Upon returning to Baldwin Wallace in 2005, The Mill published his poetry in 2005 and 2006. He also has contributed to Hessler Street Fair anthologies intermittently from 2007 to 2015, placing third in the competition in 2008. He also had some exposure in a literary magazine Muse sponsored by The Lit in 2009. Cover Artist Danielle Stull majored in Art at Youngstown State University. Along with her painting and sculpting interests, Danielle has been tattooing, for the last decade, unique designs for customers. She is currently at Focused Tattoo in Cleveland Heights, Ohio, on Coventry. 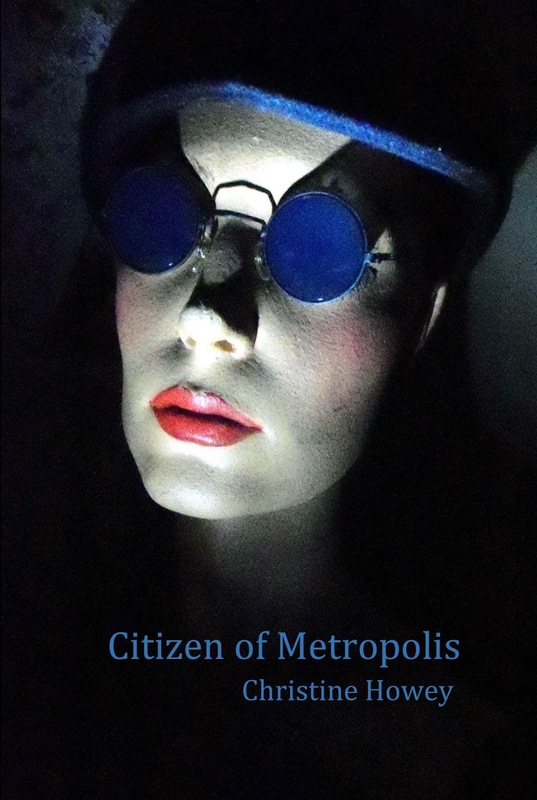 Crisis Chronicles Press is thrilled to announce the highly anticipated publication of Christine Howey's newest poetry collection, Citizen of Metropolis. "Christine Howey’s unique brand of conversational poetry blooms brightly in Citizen of Metropolis. Like a bee nuzzling flower after flower, I found myself buzzing from poem to poem, delighted to find tales of poems with wires showing, visitors from another world, reasons to sit, and babies in treetops. Howey asks questions we’d never think to ask, and then answers them, twinkle in her eye, with penetrating wit." This volume features 19 poems including "Citizen of Metropolis"; "I Don’t Like This Title"; "Things That Make Me Sit"; "Satisfaction"; "Rock-A-Bye Baby"; "One Second"; "My Muse Eats Cheetos"; "Destination Vacation"; "Meals"; "Losing It at Age 73"; "Edward Hopper, Motivational Speaker"; "An Evening Out"; "Beowulf at Breakfast"; "I Want to Write a Poem with the Wires Showing"; "My Grandson on a Sled"; "Taking Bryn, Age 7, to MOMA"; "There are Parts of My Body I No Longer Encourage People to Handle Freely"; Weather Report"; and "William Randolph Hearst, Diving Alone, San Simeon." ISBN: 978-1-64092-971-5. Christine Howey is an actor, director, theater critic and performance poet. She was the Poet Laureate of Cleveland Heights, Ohio for 2016-2018. Her one-person stage play of poetry about her transgender journey, Exact Change, was turned into a feature film. As a play, it premiered at Cleveland Public Theatre and was an official selection of the 2015 New York International Fringe Festival. The film was an official selection of the Chagrin Documentary Film Festival in 2018. Christine has had four books of poetry published. She is also a slam poet and competed in the National Poetry Slams, in 2013 and 2017, as a member of the four-person Cleveland team. Since 2002, Christine has been the theater critic for Cleveland Scene and she also posts reviews on her blog, Rave and Pan. She has been named Best Critic in Ohio by both the Press Club of Cleveland and the Society of Professional Journalists. Christine was awarded a Creative Workforce Fellowship in 2014 from the Community Partnership for Arts and Culture, and an Individual Excellence Award from the Ohio Arts Council in 2016, which also granted her a 13-week residency at the Fine Arts Work Center in Provincetown, MA. She was honored to receive the Illumination Award as the transgender leader of the year in northeast Ohio for 2015, and the Torch Award for leadership on transgender issues from the Cleveland chapter of the Human Rights Campaign in 2017.